Vessel arriving at Meadowside Quay. 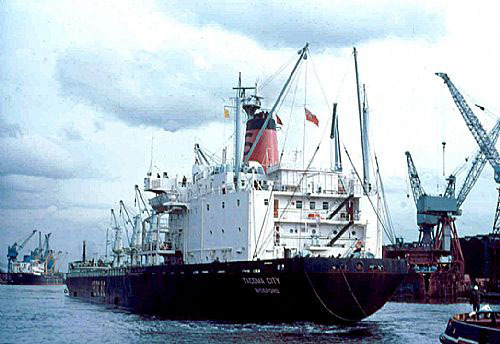 Tacoma City arriving Cardiff 16th December 1973. From the collection of Malcolm Cranfield. Copyright ©John Wiltshire. The following is the list of Officers who were aboard at the time. Master: T. R. McNulty, C/O: R. E. Clifford, 2/O: P. G. Deschamps, 3/O: B. T. Hernaman, R/O: R. H. Sellar, M. W. Savory, C/E: J. Scott, 2/E: B. J. Allsopp, 3/E: P. J. Morris, 4/E: R. E. Diamond, J/4/E: G. A. Lewis, J/E: W. M. Powell, Elect: A. S. Stokes, Cat.Off: C. A. Matthews, Dk. Cadets: M. Wilcox, A. Thomson, M. J. Voisy, Eng.Cadet:- R. C. Powell. 1975 at Bahia Blanca. Photo supplied by John Cann.